Making paneer at home is very easy. It does not involve too much cooking time, You need only 10 minutes near stove top and then 30 minutes resting time and it is ready. Paneer is also known as Indian cottage cheese. Though it different from the cottage cheese in container available in American grocery stores. This Indian cheese is not fermented like other cheeses. Paneer is made from only two ingredients: Full fat milk and food acid. Always use full cream or full fat milk. Also use cow’s milk or Buffalo’s milk. Here I have used Cow’s milk which has less fat contents than Buffalo’s. So 1 litre of cow’s milk makes 200 grams of paneer while same from the buffalo’s milk makes 225-250 grams. FOOD ACID: It can be lemon juice or white vinegar or plain sour yogurt or whey kept from previous paneer making. The method I shared here, I learnt from my Mom. It is very simple and easy. I do not get organic paneer from near by grocery store. So to make organic paneer I have used organic ingredients. There are many savories and sweets made out of paneer. 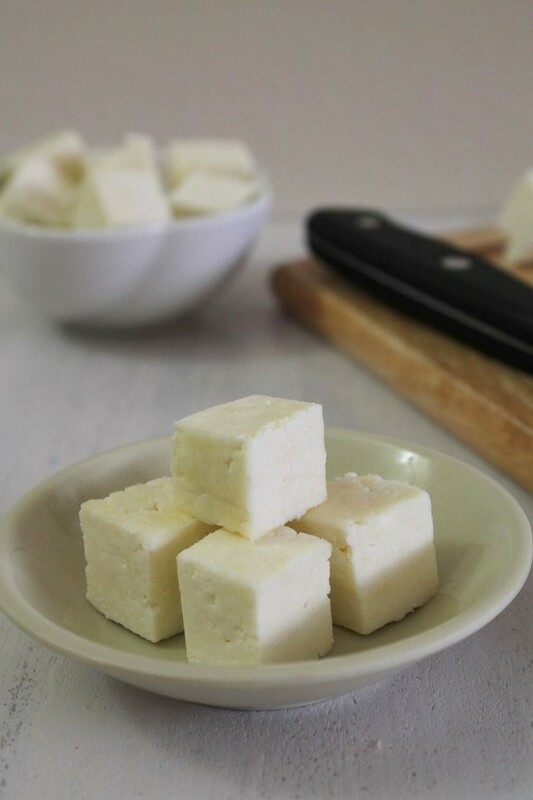 Paneer (in cube form or shredded form) is used in savory dishes while the one used in sweet dishes especially Bengali sweets is called chhena. The chhena and paneer made similar way but not the same. Then what is the difference? Curdled milk is separated from whey.This curdled milk is squeezed in the muslin cloth to remove excess whey and that coagulated milk is called as chhenna. To make paneer, let’s go one step further, put heavy weight on it and let it set. Good to know: The ‘Paneer Cookbook’ by Prabhjot Mundhir says that Paneer was known as ‘Dadhanwat’ over a decade ago. 1) Take the milk in a heavy bottom pan or patila. turn the heat on medium. 2) Let the milk come to a boil. 3) Once it boils TURN OFF THE STOVE, add a teaspoon of lemon juice. 4) Stir the milk with wooden spoon or spatula. Milk will starts to curdle. If it is not curdled completely then add more lemon juice and stir. You have to stir as milk curdles otherwise it will stick to the bottom and sides of the pan. 5) Once it curdles completely, you will see whitish or greenish whey and milk solids separated. 6) Put the muslin cloth or cheesecloth or man’s handkerchief on the strainer and keep the strainer on the bowl or jug to collect the whey. Strain curdled milk through the cloth to separate the milk solids and whey. Do not discard this nutritious whey, use the whey while making chapati dough, in soup as a stock or make cool beverages. 7) Let it strain for 5 minutes. 8) Then bring the cloth together, squeeze lightly and place it on a plate. 9) Put another plate on the top. 10) Put some weight on it, I have used books, you can use mortar and pestle or small jar full of beans or dal. and let it set under the weight for at least 30 minutes. 11) After 30-35 minutes, open the cloth and you will have paneer ready. 12) Slice it or cut it into your desired shape and size. 13) I have cut into squares and used in the matar paneer recipe. 14) Look how firm they are yet soft. It stays good for 3-4 days in refrigerator. 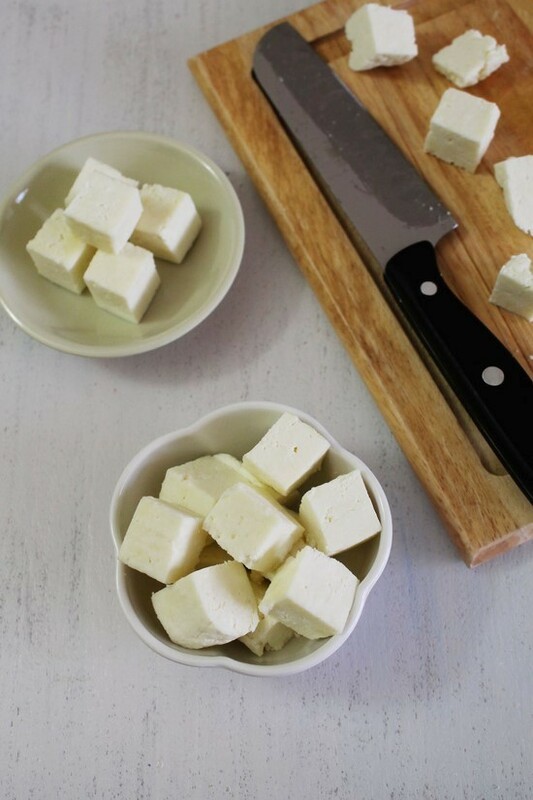 Submerge the block of paneer or cubes in the water and keep it in the fridge. (Do change the water after every 24 hours) At the time of using, remove it from water, pat dry with paper towel or kitchen napkin and use. If not kept in the water then it will dry out and becomes hard around the edges. What if you forgot to put in the water. If so then right before using, put it in warm water for 10 minutes to soften and moisten the dried edges. To freeze it, put it in ziplock bag or airtight container and freeze it. It stays good for a month (actually I have not kept more than a month so not sure that it stays good over a month). Serving suggestion: It is used in making many savory and sweet dishes. 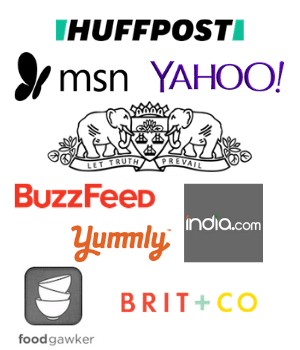 Check out this list of different Paneer recipes. First and most important, use good quality milk. better the quality of milk better the end product will be. Use of food acid: never use too much lemon juice or vinegar to curdle the milk. Always start with little. If added too much that paneer will have slight taste of that which does not taste good at all. On the safe side use sour yogurt which does not give its flavor to the end product. Once milk comes to a boil, turn off the stove and then start curdling the milk. If you forget to turn off the stove then you will get hard paneer. Curdle the milk completely, till you see the greenish whey. Once it curdles, drain it immediately. So keep cloth and strainer ready before you start making it. Do not keep the weight more than 30-40 minutes otherwise it will become more dry. It is rich in Vitamin A, B and E. It is good source of calcium. It is good for people suffering from acidity (of course sweets like rasgulla not spicy curries). Good for growing kids who needs vitamins for body growth. It has the kind of protein which is easy on stomach unlike many beans. Uncooked paneer marinated with lemon juice and consumed along with other food helps in digestion. Eating it in the breakfast will help in weight loss while eating it in dinner promotes weight gain or weight management. Having said all the health benefits, It should be consumed in MODERATION, after all it has fat. Take the milk in a heavy bottom pan or patila. turn the heat on medium and let the milk come to a boil. Once it boils TURN OFF THE STOVE, add a teaspoon of lemon juice. Stir the milk with wooden spoon or spatula. Milk will starts to curdle. If it is not curdled completely then add more lemon juice and stir. Once it curdles completely, you will see whitish or greenish whey and milk solids separated. Put the muslin cloth or cheesecloth or man’s handkerchief on the strainer and keep the strainer on the bowl or jug to collect the whey. Strain curdled milk through the cloth to separate the milk solids and whey. Let it strain for 5 minutes. Then bring the cloth together, squeeze lightly and place it on a plate. Put another plate on the top. Put some weight on it, and let it set under the weight for at least 30 minutes. After 30-35 minutes, open the cloth. Slice it or cut it into your desired shape and size. calculate yourself. I have made paneer from one-liter milk and mentioned the yield.